2:41 a.m. — Officers received a call from 1300 Harding Way East, Galion East Apartments about a woman screaming for help in a vehicle. Police could not locate the car. 2:46 a.m. — A man called police reporting he had been assaulted by an acquaintance in the 300 block of West Church Street. Police took information from the alleged victim, but no report was written. 12:18 p.m. — Police made a traffic stop near the intersection of Grant and North Market streets. Police said driver seemed very confused. A relative came to pick him up and to take possession of the vehicle. 2:14 p.m. — A man told police his lawn mower was supposed to be worked on at a business in the 300 block of Harding Way East, and he has been unable to get it back. 2:36 p.m. — Another semi ignored detours and got stuck on Carter Drive, blocking traffic. 5:23 p.m. — A man told police someone was on his property in the 1200 block of Harding Way East. He said his gate was opened, plants were knocked over and rugs had been moved. 6:49 p.m. — A man was given a warning for excessive use of 911 after calling police from his work site. 9:27 p.m. — A man found a dog bone in his mailbox and turned it over to police because it seemed suspicious. 10:29 p.m. — A pizza delivery man reported being attacked and bitten by a dog. He was taken to Galion Community Hospital for a hand wound. 12:14 a.m. — Police responded to a report of loud music. 1:48 p.m. — Police found two men “slightly intoxicated and took them to a house not far away. 3: 11 a.m. — After a traffic stop, police summonses to a man for possession and another for an open container violation. 3:22 a.m. — Police received a call about someone breaking to a neighbors garage. 3:22 p.m. — A man in in the 100 block of Harding Way East tole police he wanted a relative arrested for being unruly. 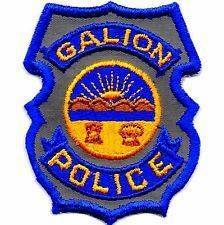 3:28 p.m. — A Galion resident made a report at the police that someone had stolen his identity. 6:04 p.m. — Police investigated a domestic dispute in the 200 block of Gill Avenue. 8:23 p.m. — A resident in the 600 block of Westwood Avenue reported dogs in the area were barking all the time. 9: 36 p.m. — Officers took information for a report, saying she thinks someone was trying to poison a dog in the 200 block of Grant Street. 10:49 p.m. — A caller in the 600 block of East Church Street said she didn’t feel safe anymore, following an altercation earlier in the evening. 1:57 a.m. — After a traffic stop a several citations was issued for underage consumption of alcohol. 4:57 p.m. — A man was taken to the Crawford County after a relative said the man was drunk and would not leave. 4:59 p.m. — A car was reported stole and a report was taken at the police station. 5:29 p.m. — A South Pierce Street resident reported her home was broken into while the family was away. 7:25 a.m. — A report of storm damage from a tree falling on a van and powerlines in the area of Spring and Mansfield St was taken. 10:20 a.m. — A minor accident in the 400 block of N Sandusky Ave. was investigated. 11:21 a.m. — A subject came on station to speak with an officer regarding theft. 11:32 a.m. — Officers assisted Adult Probation in the 800 block of South Poplar Street. 12:22 p.m. — A false alarm was received from the 200 block of Brentwood Drive. 12:28 p.m. — Four juveniles were reported missing from the area of Harmon Park. They were later located at the library. 12:34 p.m. — A disturbance was investigated in the 100 block of Wayne Ave.
1:40 p.m. — A dog bite complaint was taken at Bucyrus Community Hospital. 1:47 p.m. — A report of phone threats in the 200 block of Norton Way was investigated. 1:51 p.m. — A domestic dispute in the 1400 block of Hopley Avenye was investigated. 2:20 p.m. — Officers investigated a report of a suspicious person in the 200 block of East Mary Street. 2:25 p.m. — A report of a vehicle break-in in the 700 block of South Sandusky Avenue was investigated. 2:48 p.m. — Officers checked the welfare of a resident in the 100 block of Plymouth Street. 3:24 p.m. — A report of a disturbance between neighbors was investigated. 3:31 p.m. — A 9-1-1 hang up call from the 300 block of James Street was investigated. 5:04 p.m. — Officers checked the welfare of a resident in the 1700 block of Whetstone Street. 5:06 p.m. — A domestic disturbance in the 400 block of Woodlawn Avenue was investigated. 6:38 p.m. — A report of a suspicious vehicle was investigated in the 900 block of S. East Street. 6:54 p.m. — Officers assisted a motorist locked out of his vehicle in the 1100 block of Jefferson Street. 7:12 p.m. — Officers retrieved and disposed of a syringe found on the ground in the 900 block of Wingert Street. 9:22 p.m. — A cell phone reported stolen at Sk8Factory was located in a restroom at the business and returned to the owner. 10:07 p.m. — A report of a possible intoxicated driver on North Sandusky Avenue was investigated. 12:13 a.m. — Officers spoke to a female in the 300 block of W. Center St. about a violation of a no contact order. 12:17 a.m. — A report of fireworks in the 1200 block of N. Sandusky Ave. was investigated. 2:16 a.m. — A report of an intoxicated male and female walking in the 500 block of N. Sandusky Ave. was investigated. 9:57 a.m. — Officers investigated a report of a truck that pulled down wires in the 600 block of W. Perry St.
12:20 p.m. — A report of vandalism to a yard in the 800 block of Sherman St. was investigated. 1:51 p.m. — Officers investigated a report of a verbal domestic in the 100 block of W. Rensselaer St.
3:23 p.m. — A report of illegal trash dumping was investigated in the 200 block of N. Walnut St.
3:26 p.m. — Officers spoke to a person on station about a Craig’slist scam. 4:23 p.m. — A report of an unruly juvenile was made in the 600 block of N. Sandusky Av. 5:52 p.m. — A report of teenagers trespassing in the area of Southern and Winchester Av. was investigated. 5:58 p.m. — A 911 open line call was investigated in the 500 block of S. East St.
7:45 p.m. — Officers picked up a suitcase that fell off of a vehicle in the area of Woodlawn and Prospect St.
7:48 p.m. — A parking complaint in the 800 block of Woodlawn Av. was investigated. 9:01 p.m. — A report of people in the high water at Aumiller Park was investigated. 9:04 p.m. — Officers assisted Life Support Team — in the 1200 block of Teddy Av. 9:46 p.m. — A domestic dispute was investigated in the 400 block of Heritage Circle. 10:36 p.m. — A report of a possible drunk driver was made on Lakewood Dr.
10:58 p.m. — Officers assisted a motorist locked out of their vehicle in the 300 block of Sheckler. 11:39 p.m. — Officers initiated a traffic stop in the area of E. Rensselaer St. and S. Walnut St.
11:52 p.m. — Officers responded to an accident on Washington Square. 11:58 p.m. — A report of fireworks in the Dudley St. area was investigated. 11:58 p.m. — Anthony Morgan, 47, was arrested for obstruction. He was issued a criminal summons and released with a court date. 12:37 a.m. — A resident in the 900 block of Elm St. reported $60 stolen. 12:51 a.m. — Officers responded to a disturbance at Dillinger’s on Washington Square. 12:53 a.m. — A report of a barking dog in the 200 block of S. Lane St. was investigated. 12:58 a.m. — Officers assisted Crawford County Sheriff’s Office in trying to locate a stolen vehicle. 1:19 a.m. — Officers responded to a report of a large group of people yelling behind Dillinger’s. 1:30 a.m. — A report of a suspicious person in the Home Circle Dr. area was investigated. 2:27 a.m. — Officers on patrol investigated a rowdy group outside in the 100 block of W. Mary St.
2:32 a.m. — Officers responded to a domestic issue in the 1400 block of Whetstone St.
2:59 a.m. — Officers responded to a domestic issue in the 1400 block of Whetstone St.
3:13 a.m. — A male was cited for driving under suspension in the 1400 block of Whetstone St.
8:26 a.m. — Officers picked up an abandoned boy’s bike in the 500 block of Rogers St.
10:00 a.m. — Officers picked up a purse that was left at Aumiller Park yesterday. 11:10 a.m. — A false alarm was received in the 1000 block of Martha Ave.
12:53 p.m. — A Crestline woman reported cash, medication, her driver’s license, and her wallet stolen from her purse in the area of Aumiller Park. 3:57 p.m. — A false alarm in the 500 block of W. Warren Street was investigated. 4:16 p.m. — A false alarm at Bucyrus Copper Kettle was investigated. 4:25 p.m. — A false alarm in the 1500 block of Marion Road was investigated. 4:48 p.m. — A false alarm in the 700 block of Hopley Avenue was investigated. 4:59 p.m. — A report of an unwanted person damaging property at a residence in the 700 block of Sunset Drive was investigated. 5:19 p.m. — A report of a loose dog in the 600 block of E. Warren Street was investigated. 5:34 p.m. — A resident in the 1200 block of Teddy Avenue reported that someone broke into the residence and stole some items. 6:18 p.m. — A vehicle reported stolen out of Washington County was located at Harmon Park and brought to the Police Department to be held. 6:55 p.m. — Officers responded with EMS personnel to the 100 block of W. Mansfield Street for a possible overdose. 7:43 p.m. — A resident in the 200 block of Harper Avenue reported his window pried open and medication stolen from his residence. 8:37 p.m. — A motorist reported a limb down in the roadway in the 100 block of N. Spring Street. A patrol officer moved it out of the road. 9:01 p.m. — A motorist reported cigars stolen from his vehicle while parked on E. Lucas Street last night. 10:43 p.m. — A report of a suspicious person walking in the area of High and Wilbur Street was investigated. 2:10 a.m. — A resident in the 1500 block of East Southern Avenue reported seeing someone in her vehicle.